Nairobi, May 25, 2012--Police in Ethiopia today detained Peter Heinlein, a correspondent for the U.S. government-funded broadcaster Voice of America, along with Simegnish Yekoye, a freelance reporter and Heinlein's interpreter, according to Jennifer Janin, the Africa coverage editor for VOA, and local journalists. Heinlein and Simegnish were detained while covering a demonstration of Muslims protesting alleged government interference in religious affairs, Janin said. They were being held late today at Maekelawi federal detention center in the capital, Addis Ababa, local journalists said. In recent weeks, members of Ethiopia's estimated 30 million Muslims have been staging protests on Fridays in Addis Ababa to oppose government policies they say interfere with religious affairs, according to news reports. The protests are a highly sensitive issue for the government, which fears a hardline Islamist influence within the country, according towire reports. Shimeles Kemal, a spokesman for the Ethiopian government, said that Heinlein was being held because he was allegedly using a diplomatic car and refused to show his press identification, local journalists told CPJ. No official charges have been filed, the journalists said. "Peter Heinlein is a veteran reporter with many years' experience in the profession," said CPJ East Africa Consultant Tom Rhodes. "We call for the immediate release of Heinlein and Simegnish Yekoye." VOA's Amharic-language service broadcasts are sometimes jammed and its website periodically blocked in Ethiopia, according to CPJ research. In recent years, the Ethiopian government has used intimidation, imprisonment, and expulsions to silence independent reporting of VOA reporters. Veteran correspondent Peter Heinlein and translator Simegineh Yekoye were arrested Friday as they were leaving a mosque on the outskirts of Addis Ababa. Heinlein told VOA editors Saturday he was questioned at length about the purposes of his reporting. Heinlein said he and Simegineh were released and all charges were dropped after an official from the U.S. Embassy's consular section appeared at the prison Saturday morning. He said computer and recording equipment that were confiscated upon his arrest were returned and that he and Simegineh are in good health. Voice of America issued a statement from its headquarters in Washington saying it is relieved by Heinlein's release. Heinlein said the arrest appeared to be connected to his reporting on a dispute between Ethiopia's Muslim minority and the government over the leadership of the nation's Muslim community. He said he and Simegineh appeared to have inadvertently crossed police lines aimed at keeping reporters away from a meeting after Friday prayers at the mosque where the dispute was being discussed. He said police stopped his car as he and the translator were leaving the mosque, and later took the two of them to a local police station. From there, they were transferred to the city's main police station for questioning. He said Simegineh had been permitted to return home overnight because there was not a suitable place to keep her in the prison and ordered to return Saturday morning. Heinlein, an east Africa correspondent based in Addis Ababa, has worked for VOA since 1988. A Voice of America (VOA) correspondent and his translator were detained Friday in the Ethiopian capital Addis Ababa while covering an anti-government protest, the US government-funded broadcaster said. VOA said reporter Peter Heinlein and interpreter Simegineh Yekoye were arrested while trying to interview members of Ethiopia's Muslim minority who have been protesting alleged government interference in their affairs. In a statement, VOA said it is "working to gather more information" about his status. "The safety and welfare of our reporters is our utmost concern," it said. "We have been in contact (with) State Department officials and will release details as soon as they are available," VOA said. "We urge Ethiopian authorities to allow Mr. Heinlein to carry out his journalistic responsibilities without interference," it said. Leslie Lefkow, the deputy Africa director for Human Rights Watch, told AFP that Heinlein and his translator were taken to Maekelawi, the federal investigation center in Addis Ababa, which is where "high-profile or political detainees are often held." She cited media and other sources. She said such detentions are part of a crackdown on the media that Human Rights Watch has witnessed over the years where independent journalists have been driven from the country or jailed on terrorism charges. Foreign journalists have also been held in the past and deported, she said. Two Swedish journalists were jailed recently, however, for 11 years under anti-terrorism laws for trying to enter the country's conflict-torn east. The Committee to Protect Journalists (CPJ) quoted an Ethiopian government spokesman as saying that Heinlein was detained because he was "allegedly using a diplomatic car and refused to show his press identification." "Heinlein has been based in Addis for some years now, and it's very hard to imagine him behaving unethically or unprofessionally," said HRW's Lefkow. "The obvious conclusion is that the government is simply trying to crack down on coverage of these protests," she added. "The government should immediately release both Peter and his translator and stop trying to clamp down on the reporting on these protests," Lefkow said. Despite the fact that Ethiopia and the United States are allies, she said, VOA and the Ethiopian government have had a tense relationship, with Addis Ababa jamming its broadcasts and detaining VOA's Ethiopian journalists. "This is the conundrum of Ethiopia when you look at the US government position," she said. In a speech in Accra in 2009, she recalled, US President Barack Obama said Africa needs strong institutions rather than strong men and yet Obama invited Ethiopian Prime Minister Meles Zenawi to the G8 summit earlier this month. Alemtsehay Meketie reporting on a government meeting for the Ethiopian News Agency. ADDIS ABABA, Ethiopia — On a beautiful morning in late March, Alemtsehay Meketie rushed up the hill to the United Nations Conference Center in Addis Ababa, Ethiopia’s capital. 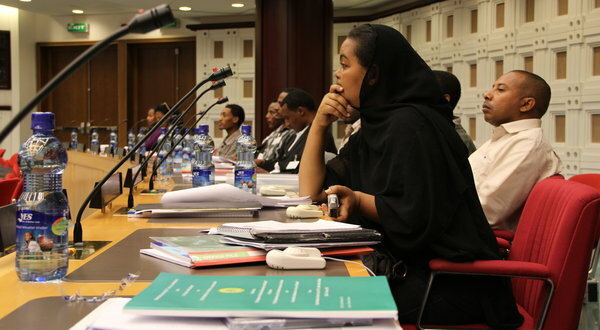 Ms. Meketie, a 32-year-old reporter for the Ethiopian News Agency, was running late for the minister’s opening speech at the 21st annual meeting of the Ethiopian Statistical Association. The Ethiopian News Agency's offices are based in a decrepit building in the north of Addis Ababa. What was the conference about? Ms. Meketie didn’t know yet. But “jiggeri yellem,” as people here say for “no problem” in Amharic, the official language. “We’ll see when we’re there,” she said, gasping. Changing almost at the speed of its marathon runners, modern Ethiopia is a far cry from what it used to be. The government’s new Growth and Transformation Plan (the subject of the conference Ms. Meketie was hurrying to) proposes to boldly remake Ethiopia into a middle-income country by 2020 and leave behind a painful history of terror, poverty and two famines in the 1970s and ’80s. The plan foresees change in the business sector, agriculture, infrastructure, health and education. It also proposes the development of mass media and changes in the practice of journalism. Some of those are already happening at the Ethiopian News Agency, the most important news agency in the country. The organization, based in a decrepit concrete building in the north of Addis that is guarded by heavily armed police forces and has windows that have not been cleaned for a long time, is planning a 24-7 TV news channel in four languages: Amharic, Arabic, English and French. Broadcast in the entire region, it would make the agency one of the biggest news outlets in East Africa — if the channel wins government approval. “We want to become the most quotable source in the region,” said Teshome Negatu, who is the head of the multimedia and information department at the agency. But whether this will mean more tolerance of the free press in a country notorious for cracking down on critical journalists remains to be seen. The news agency has been state-owned since its start 70 years ago and has never been free of censorship. Few of the pieces it writes or translates (from sources like the BBC) are remotely critical of the government. Even criticizing the new Growth and Transformation Plan, for example, is taboo. Many of the agency’s employees spoke openly of the self-censorship they must practice and of their frustrations. “It’s very difficult sometimes,” one employee said, speaking on the condition of anonymity for fear of being fired or arrested. “Covering the prime minister involved in a massive case of corruption would be impossible.” Another staff member recounted the recent case of a bush fire that the agency’s local reporter had refused to cover because he was worried it could be perceived as too critical of the government. Yet many of the employees said the situation had improved and was nothing like the experience under the communist Derg regime during the 1980s, when one had to fear for one’s life. So far, only a few of the agency’s approximately 50 dispatches a day are published through other media; most are on its own home page, which looks static. Following big news agencies like Xinhua and Reuters, the Ethiopian News Agency wants to shift from a pure content provider to an independent media outlet, complete with new computers and a bigger staff. The new, fancy Web site is already finished. Its chief competitors are the state-owned Ethiopian Television and two independent newspapers, The Reporter and Capital, that are among the most popular media in the country. But they too are subject to government censorship. During his 30 years at the agency, Mr. Negatu has witnessed its ups and downs. A high point was the first computer in 2000, a low point the reorganization two years ago that left it without a director until recently. That made it a daily struggle to cover a country almost twice the size of Texas at the national, regional and local levels with a small staff of around 120 reporters and editors. While Mr. Negatu would like to become one of the agency’s first foreign correspondents, Ms. Meketie dreams of working as a news anchor. As a teenager, she read news pieces aloud in her room, and later she studied broadcast journalism at Addis Ababa University. Ms. Meketie now tries to cover women’s issues. Some employees considered the appointment of Mr. Zinaye as a sign of a more understanding government because Mr. Zinaye was a journalist like them. Mr. Zinaye worked for the state-owned radio and used to be the director of Addis Ababa University’s journalism program. The only thing missing for meeting the agency’s television goal is the government’s approval. The project matches well with the government’s desire to make Ethiopia a beacon at the Horn of Africa and across the continent. 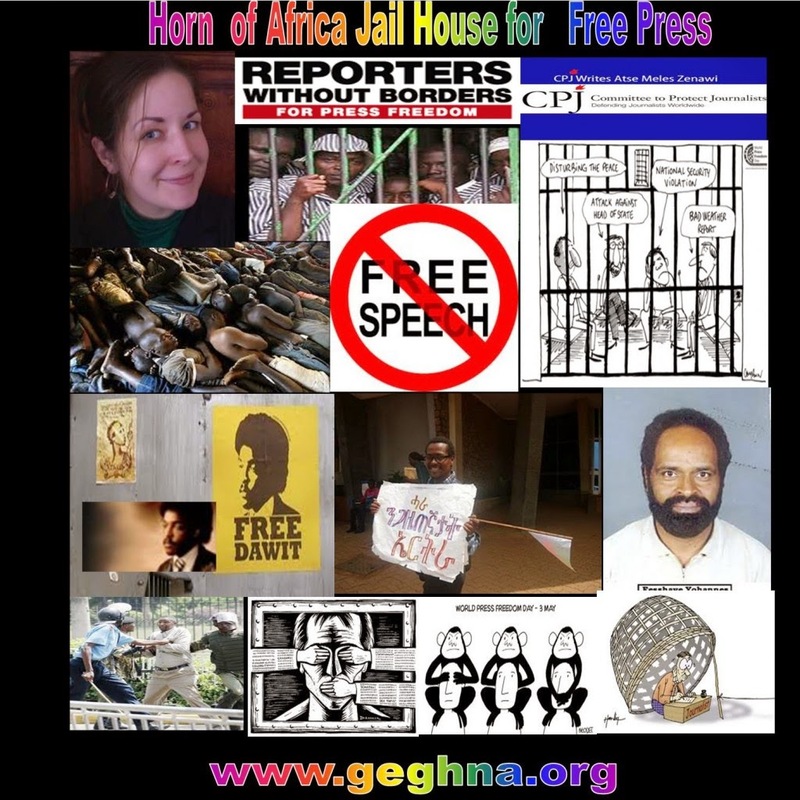 But does modernizing an old news agency mean a new era for greater press freedom in Ethiopia? “I’m not sure,” one of the agency’s longtime editors said, rolling his eyes. (Paul Schemm/ Associated Press ) - Workers at a polling station count ballots at a polling station in the Bab el-Oued neighborhood, Algiers, Thursday, May 10, 2012. As parliamentary elections unfolded across Algeria on Thursday, voting was light for much of day in the capital, despite these contests being billed the freest in 20 years. ALGIERS, Algeria — Islamists suffered a surprising defeat in Algeria’s parliamentary elections, bucking a trend that saw them gain power across North Africa after Arab Spring uprisings. Soltani told journalists that his alliance would discuss whether they would pull out of parliament, but said their most likely move was to attempt to ally with the smattering of other leftist and liberal parties in the opposition. “These results will send the Algerian spring backwards,” he added. Algeria was largely spared the pro-democracy demonstrations that swept North Africa and the Middle East over the past year, cushioned by its huge wealth of oil and natural gas, and a population still traumatized by the violence that followed a military coup in 1991 when another Islamist party nearly won elections. President Abdelaziz Bouteflika announced reforms in 2011, however, and said the new parliament would be involved in rewriting the constitution. In the runup to elections, the government portrayed the parliamentary contests as “Algeria’s Spring” and invited in 500 international observers, promising these would be the freest polls in 20 years. For the Islamists, however, the overwhelming victory for the government parties smacked of fraud, something that has characterized many past elections. “Of course there was fraud,” said Abderrazzak Mukri, the alliance’s campaign manager. He said initial tabulations from voting stations Thursday night had put the Islamist party as a close second to the FLN. Interior Minister Dahu Ould Kablia, who announced the results Friday, dismissed any possibilities of fraud and described the elections as free, transparent and fair. In the 1991 elections that were canceled, the FLN took only a handful of seats compared to a crushing victory of the Islamist Salvation Front, which was later banned.